Can you differentiate between a dehumidifier and air conditioner? You’ve probably don’t know their differences, and that’s exactly why we wrote this article — to educate you on the major difference between dehumidifier and air conditioner. We all love that energizing moment when we walk into a super cool room after a hot day. How about when you get into the basement without seeing any sign of humidity? Does that sound great? Obviously, it should because nothing is as worse as having a begrimed and damp basement. However, most people have relied on household appliances such as dehumidifiers and air conditioners. Nevertheless, the key question lurking in the mind of many is what the difference between them is and which is preferable over the other. The question of air conditioners and dehumidifier is like the battle for survival. It is a well-known debate with each having its own point of view depending on what suits you. However, in this article, we will take a detailed look at both in such a way that you can decide for yourself which is suitable for you. These are systems, which treat air within an enclosed area using a refrigeration cycle through which the air is removed and replaced with cooler air. Most times in construction, they are called HVAC systems. They come in different types but the one you use will depend on different factors such as the amount of heat generated, how large the area to cool is, etc. Your HVAC designer will provide all of these parameters and suggestions. Window air conditioner is widely used for single rooms. The components of this air conditioner such as a condenser, cooling and evaporator coil, expansion coil or valve, and a compressor are packaged in a single box. The air unit is then fitted into a slot through the wall. Split Air conditioner comprises of two parts – the indoor and outdoor units. The indoor unit includes the cooling fan and the cooling or evaporator coil while the outdoor unit comprises of the expansion valve, condenser, and the compressor. You can use them in single or double rooms. The packaged Air conditioner is widely used if you want two or more rooms to be cooled. The arrangement of the packaged air conditioner is of two types. The first comprises of the condenser, expansion valve, compressor, and the evaporator all housed within a box. The second has the condenser and compressor in one casing while the compressed gas goes through each unit. 1. Portable Air Conditioners: This type is installed inside the room with a hose taking the hot air outside the building. These systems are moveable easily and capable of being placed wherever you desire. 2. Ductless Air Conditioners: These units have two separate units – indoor and outdoor. Additionally, they do not require any duct. 3. Central Air Conditioners: Unlike other types, these are positioned to cool an entire building. These systems use a larger compressor to produce the cooling effect experienced. They are a household appliance that minimizes the level of humidity in your home. They’re widely used for comfort and health reasons. It also removes excess moisture, which helps in preventing bacteria, mold, and other things that thrive on wet conditions. In America today, almost every household owns a dehumidifier and the number is increasing. Most of these new units are cheap, compact, and quieter. You may not notice its presence once you start using it. Are you thinking of buying one? 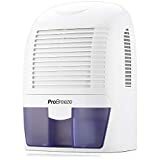 I will share some dehumidifiers that may be good for you to buy. However, if you are still contemplating if buying it is necessary; the following reasons will change that. Desiccant: This type of dehumidifier contains a chemical called “desiccant” for the purpose of releasing and absorbing moisture. In terms of consistency, they are good machines. These units try as much as possible to avoid power fluctuations and have the capacity of reducing your electricity bill. Thermoelectric: This type uses “Peltier Module.” Electricity goes through the module thereby leaving one side cold and the other side of the module hot. The cold side is where the air loses its humidity. Refrigerated Coil: This type of dehumidifier works in a similar fashion like refrigerators. Hot air goes through the refrigerated coil and fan. The coil then traps the moisture from the air and further removes the humidity. Although dehumidifiers are similar in that they reduce the level of humidity in a particular place, they also do have few differences with air conditioners that should be noted. What most people don’t know is that dehumidifiers and air conditioners function differently such that they don’t recognize that their heat transfer mechanism is identical. Although, they have identical form but function differently. Unlike air conditioners, dehumidifiers are used in damp or cool spaces where mold growth is inevitable. It works by taking moist air to the evaporator coil and further to the condenser coil before releasing it back to the room. As the air goes through the condenser coil, the air is warmed thereby releasing warmer air and producing a warming effect in the room. This warm air from the condenser coil further helps in reducing the level of humidity in an indirect manner. On the other hand, air conditioners help reduce the humidity level in a room instead of warming the air; they cool it thereby making a sticky environment more comfortable. Unlike dehumidifiers, which are kept within the area where they are required, air conditioners are kept outdoors. Moist or warm air is taken into the unit or the vent in the wall. Air conditioner works in similar fashion as the dehumidifier. As the air passes through the condenser coil, the warm effect created is released outside of the room thereby producing a cooler environment. In a simpler form, the major difference between an air conditioner and dehumidifier is that the dehumidifier reduces the level of humidity by drying the air thereby making it warmer. However, an air conditioner removes humidity by cooling the air. Hope you understand this simple but enlightening difference between air conditioners and dehumidifiers. In terms of energy usage, air conditioner consumes more energy, which increases your power bill. The debate concerning energy consumption is not all-encompassing because of the various types of dehumidifiers and air conditioners. Nevertheless, dehumidifiers consume on 1/10ths of what your air conditioner consumes. Therefore, to cut down your power bill, you should consider using an inverter. 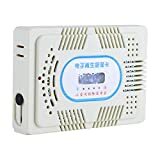 This efficient mini dehumidifier works perfectly by removing mold, damp, and moisture from the air. You can use it for medium to small areas including small basement, kitchen, wardrobe, boat, garage, caravan, and anywhere prone to damp air. It comes with built-in Peltier technology. Unlike other dehumidifiers, this can absorb 18 ounces of moisture daily while remaining lightweight, compact, and working efficiently with low consumption of power. Considerably on the high side in terms of price but doesn’t take the effectiveness from it. It is worth investing in to take care of your humidity problems. It comes with a washable filter and an automatic defrost. Aside from this, it reduces peculiar smell and frees you from any harm from dust. Space is not an issue because it is ideal for places such as basement, kitchen, living room, bedroom, garage, and office. The green light signifies that it is working while yellow means it is in the resting state. It is Eco-friendly and can absorb water up to 300mL per day. This dehumidifier may be perfect if you have a small room and low on budget. If you are thinking of moving to a bigger place, it is better to buy a bigger dehumidifier. If you are a student, you can invest in it as it won’t disturb you when studying. As promised at the beginning of this article, I have exposed the key difference between dehumidifier and air conditioner. Apart from that, we also mentioned some of the best dehumidifiers for bedroom based on the information gathered from customers rating. Some of the issues faced by these customers were stated as the downside of the product. Nevertheless, it is important to note that every customer has his or her opinion about a particular product. While this review shouldn’t be the final guide if you want to buy, ensure you look for other criteria before investing your money. The experience of every customer regarding a particular product is different and at times, it all boils down to maintenance. If you have questions or want to get in touch with us, you can visit our contact page. We will get back to you as soon as possible. That said, you can use a dehumidifier and air conditioner concurrently depending on the season. An air conditioner can remove approximately 18 gallons of water in a room. However, a dehumidifier can be used after or before air conditioning season to reduce the level of humidity. It is important to monitor your indoor humidity to prevent the growth of mildew and mold, which can be detrimental to your health. Considering the fact that humidity isn’t limited to during the summer period, dehumidifiers can be a worthwhile investment to prevent mold and moisture.